Was there ever a time that you felt hopeless? Did you hold onto hope? May the feature article, Hoping Is Not A Hopeless Endeavor, remind you the importance to keep on hoping. As for me, the greatest comfort is from the promises of God. Do you want to have a hope that does not disappoint? Having a healthy dose of hope can be motivating and inspiring. It keeps people focused on what's ahead instead of what's in the past. It can also help keep the focus on possibilities, and reframe obstacles as opportunities. For some, however, being hopeful goes hand-in-hand with feeling naive or foolish when things don't work out as planned. They would rather not have hope at all if it means later disappointment. But for others, having hope doesn't mean living in denial of life's difficulties; it simply reminds them there are better times ahead. Research indicates that it's more beneficial to have hope than not. 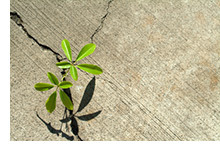 Hopeful people tend to show more resilience when faced with difficulties. They have healthier lifestyle habits and, on the whole, are more successful, personally and professionally. We humans are sometimes too inventive for our own good -- we can envision a future course of action along with every potential catastrophe that could occur along the way. Being aware of everything that can go wrong often makes doing nothing -- in an attempt to avoid failure or pain -- seem like a viable option. Hope brings with it the belief that things can change for the better. Regardless of how dire things may seem, there is potential for a positive outcome. It could be said that optimists have a healthy dose of hope while "extreme optimists" suffer from blinding hope. They want nothing to do with bad news. Researchers at Duke University found that extreme optimists (you could call them "high-hopers") don't save money, don't pay off credit cards and don't make long-term plans, but they are more likely to remarry if divorced. Being a moderate high-hoper doesn't mean keeping your head in the sand when it comes to life's occasional unpleasant circumstances. It just means keeping a positive attitude -- believing the best will happen, not the worst. In other words, whether you expect the best or the worst from life, chances are that's what you'll get. Studies seem to suggest that being hopeful is a skill that can be learned. So whether you're an extreme optimist, an extreme pessimist or somewhere in between, there is hope for us all. Are you in a seemingly hopeless situation? You are not alone!